Who says you can't turn back time? At History of the Opera House mural, time rewinds. 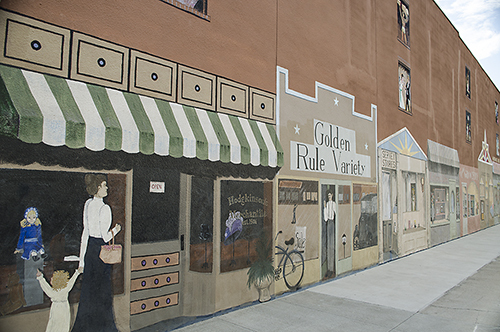 The mural tells the story of Goodland's Grand Opera House and its tenants. Stroll through 90 years of history from the east end with Hodgkinson's Merchantile from 1906 through Q's Pool Hall and 1996. The mural nearly didn't happen. Grant funding for the two-story, 100-foot long mural fell through. The building owner, Rod Cooper, agreed to fund the project, which took over a year, from 2011-12. First, he had to ensure the wall was in good repair. Then Chief Artist Elwyn Vatcher painted the top half of the mural brown and the bottom half -- the store fronts -- white. Then he and Shirley Houston, Laurie Albin and Jacquelynn Gulley, a high school senior, started painting. The windows above the storefronts show activities that took place in the Grand Opera House, such as singing, roller skating, dancing and wrestling. The upstairs windows on the west are not historical. The upper western window shows Goodland's Three Sunflowers in a Vase, one of the World's Largest Paintings on an Easel. The lower one shows building owner Cooper and family. The opera house, which was above the storefronts, held its grand opening Dec. 10, 1906, with a performance of "The Nature's Nobleman". Once a "leg show" featuring 110 dancing girls was held here. The most famous person to perform in the opera house was Milburn Stone, who later played "Doc" in the long-running TV Western Gunsmoke. Even though building was named Grand Opera House, an actual opera probably never played here. Venues named opera houses were considered respectable places where ladies could enter. Any other venue would have been considered a male-only preserve, a place where a respectable lady could never enter. How a "leg show" fit into Edwardian Era respectability is another question. The building's current tenant is Goodland Churches Thrift Shop. All proceeds from the thrift shop go to help those in need. Buy something and support local charities. Open Monday-Friday 10 a.m.-5 p.m.
Albin also painted Bygone Days on the Bricks. She restored the mural on the back wall of the Sherman Theatre. See more of Vatcher's and Houston's art works at Black Bird Gallery, just a half block away from the mural. The Vault Creamery and Bake Shop is next door to the gallery. Also view Art Deco splendor at United Telephone Building, across the street from the mural's east end. The old First National Bank Building, site of the armed climax to the County Seat Fight, is one block to the south.